How to make sure your manual doesn't turn into a long list of "don'ts"
"Is it best to write in the positive, or do I focus on what employees should NOT do?" "What exactly are the legal traps I need to watch out for?" "I'm no writer - so how am I ever going to tackle this job? You can get the help you need and answers to all these questions - including dozens you haven't even thought to ask - at this information-packed one-day seminar. Here's the simple truth: Well-written, concise policies and procedures are the framework that holds your organization together and makes everything run smoothly and efficiently. 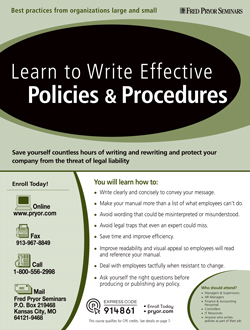 Attend this one-of-a-kind, career-enhancing program and learn valuable techniques for writing policies and procedures with skill and ease. 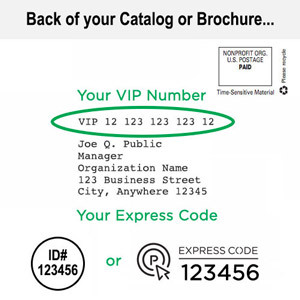 Don't wait until there's an unfortunate misunderstanding, a critical mistake, or even a lawsuit that solid documentation could have prevented. Take action today!